U.S. Military To Allow Transgender Recruits After Trump Administration Drops Appeal : The Two-Way An LGBT activist says the Trump administration has waved "the white flag," dropping an appeal of court rulings blocking a ban on transgender troops. 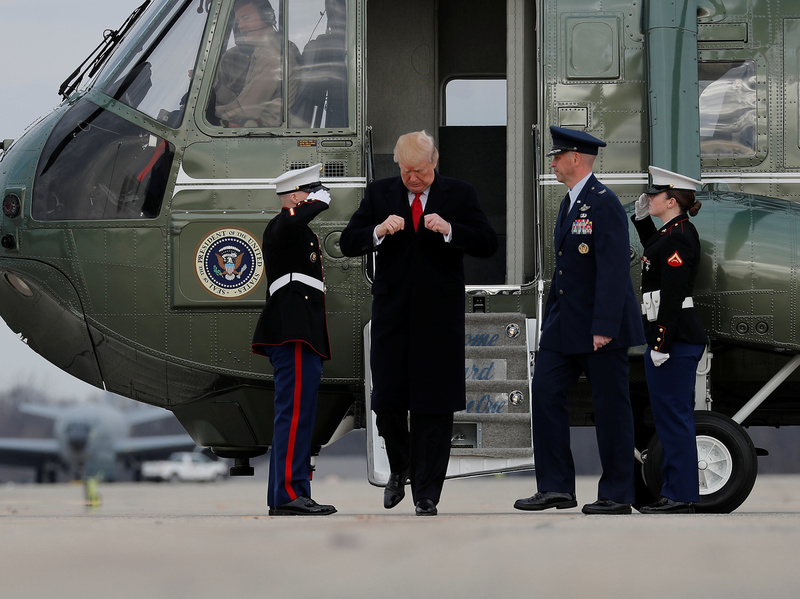 President Trump arrives to board Air Force One at Joint Base Andrews in Maryland on Dec. 22. Openly transgender people will be allowed to enlist in the military starting Monday after the White House decided not to appeal. In deciding not to appeal court rulings, the Trump administration has paved the way for transgender people to enlist in the U.S. military starting Monday. The Department of Justice withdrew its legal challenge to several federal court rulings that blocked President Trump from banning transgender people from enlisting in the U.S. armed services. Pentagon spokeswoman Heather Babb said in a statement quoted by Reuters: "As mandated by court order, the Department of Defense is prepared to begin accessing transgender applicants for military service Jan. 1. All applicants must meet all accession standards." In July, President Trump tweeted that the United States "will not accept or allow ... Transgender individuals to serve in any capacity" in the U.S. military. Trump also cited "tremendous medical costs and disruption that transgender in the military would entail." That announcement was designed to upend an Obama administration policy that would have allowed transgender enlistees. In response, LGBTQ legal advocates filed suit. Four federal judges ruled that the president couldn't enforce the ban, and two federal appeals courts upheld the lower court rulings. The Pentagon's announcement means that as of Jan. 1, openly transgender persons will be allowed to serve in the U.S. armed forces. In a statement, attorney Peter Renn of the LGBT civil rights advocacy group Lambda Legal said advocates "are relieved that we don't have to hit pause on the constitutional rights of transgender people who are willing and able to serve our country." "Federal district courts in DC, Maryland, Seattle and Los Angeles have seen through the administration's hollow arguments in support of discrimination and rejected them, as have the federal appeals courts. The war isn't over, but the government has waived [sic] the white flag before this battle even got started. The administration clearly saw the writing on the wall and withdrew its desperate effort, for now, to block transgender people from openly enlisting in the armed services and serving their country." According to a RAND Corp. study cited by the Los Angeles Times, there are between 1,320 and 6,630 transgender troops currently in uniform.